"Amazing grace, how sweet the sound that saved a wretch like me!" The favorite hymn, arranged for harp and voice. 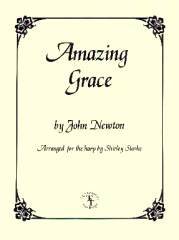 It is printed in black on ivory paper, 4 pages, 8½" x 11", and includes words (5 verses), melody for voice, chord symbols, and arrangement for the lever harp. Easy to intermediate. $3.00. "O, for a thousand tongues to sing my great Redeemer's praise!" 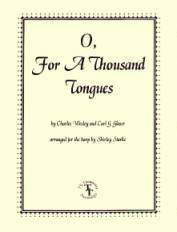 A beautiful hymn with words by Charles Wesley, arranged for harp and voice. The sheet music is 4 pages, 8½" x 11", printed in black on ivory paper. It includes words (5 verses), melody, chord symbols, and arrangement for the lever harp. Easy to intermediate. $3.00. 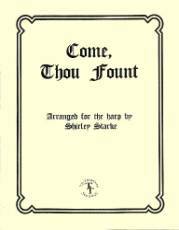 A favorite hymn, arranged for harp and voice. The sheet music is 4 pages, 8½" x 11", printed in black ink on ivory paper. It includes words (3 verses), melody, chord symbols, and arrangement for the lever harp. Easy to intermediate. $3.00. "The Lord's my Shepherd, I'll not want. 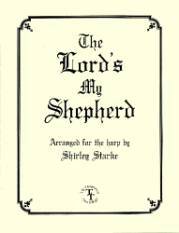 This lovely old Scottish hymn, based on Psalm 23, is presented here in an arrangement for lever harp and voice. The sheet music is 4 pages, 8½" x 11", printed in black on ivory paper, and includes words, melody for voice, chords, and arrangement for the harp. Level: easy to intermediate. $3.00. 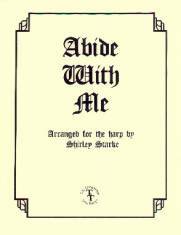 "O Thou who changest not, abide with me!" 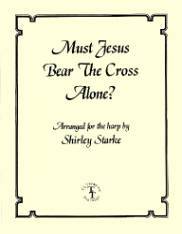 A lovely classic hymn, arranged for harp and voice. The sheet music is 4 pages, 8½" x 11", printed in black on ivory paper. 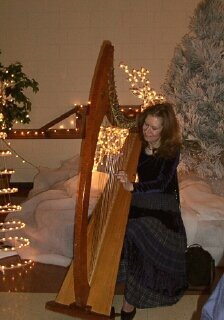 It includes words (4 verses), melody, chord symbols, and arrangement for the lever harp. Easy to intermediate. $3.00. 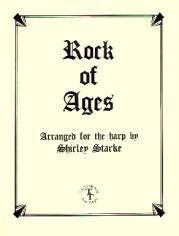 A beautiful classic hymn, arranged for harp and voice. The sheet music is 4 pages, 8½" x 11", printed in black on ivory paper. It includes words (3 verses), melody, chord symbols, and arrangement for the lever harp. Easy to intermediate. $3.00. "Nearer, my God, to Thee, Nearer to thee!" 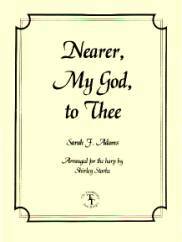 A classic hymn by Sarah F. Adams, arranged for harp and voice. This song is famous as the hymn sung by the passengers on the Titanic as their ship sank. The sheet music is 4 pages, 8½" x 11", printed in black on ivory paper. It includes words (5 verses), melody, chord symbols, and arrangement for the lever harp. Easy to intermediate. $3.00. "Must Jesus bear the cross alone, And all the world go free? No, there’s a cross for everyone, And there’s a cross for me." A beautiful old hymn with words by Thomas Shepherd and Henry Ward Beecher and melody by George N. Allan, arranged for lever harp and voice. It is 4 pages, printed in black on ivory paper, 8½" x 11", and includes words (4 verses), melody, arrangement for the lever harp, and chord symbols. Level: easy to intermediate.